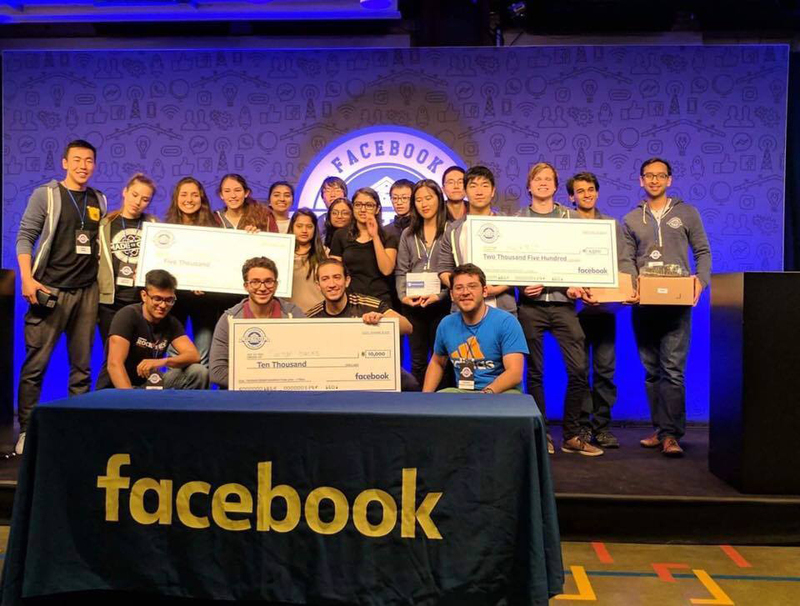 A Carnegie Mellon team, pictured in the front of the photo, won top honors in last month's Facebook Global Hackathon. Over the course of 24 hours in November, Abdelwahab Bourai, who earned his bachelor's degree in computer science this past May and is now a master's student in computational data science, worked with teammates Jean Haddad, a junior in chemical engineering; Sebastian Guerrero Cardenas, a junior majoring in information systems and human computer interaction; and SCS alumnus Vivek Krishnan to create a hack that generates highlights from complete Facebook live videos based solely on user comments. "We really wanted to use Facebook Live — we think it's a very unfiltered news source," Bourai said. "The problem is that livestreams can be two or three hours long. Nobody's going to sit there and watch it all. But people are more likely to watch five 30-second clips, which was the basic idea of our hack." At the finals, held at Facebook headquarters in Menlo Park, Calif., the team created a technology that scours comments on Live videos and filters them based on quantity and content. They demonstrated their software on a wide range of content featured on Live — they extracted goals from a soccer game, pinpointed times when Clinton or Trump were doing well in a debate, and even provided brief 30-second highlights for the entirety of the protests in Charlotte, N.C., earlier this year. "There's a lot of data right under our nose that we don't think about, that can be way more useful than what we've been looking at," Bourai said. "User comments have been around forever, but they're actually really powerful. If you're ever in doubt, play around with some data and something cool will happen. And when it does, it's a really eye-opening moment." The team qualified for the Global Hackathon by winning TartanHacks2016 this past February.